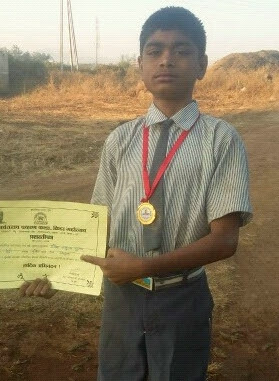 Ganesh Baburao Sutar, age 16 years, is studying in class 8th in Mahatma Phule School, Pisoli, Pune. He has two younger sisters, Pooja, 12 and Poonam 11. Their mother passed away when Poonam was just 6 months old and same time their father left the 3 children to life’s mercy and went away. Ganesh’s maternal aunts and his uncle, who works as a construction labourer, stepped up and decided to take responsibility of the children. However, the siblings are separated, each staying with one relative so as to distribute the burden of expenses. With a broken home and no one to look upto, Ganesh’s life would have been very different. But with the support from his maternal uncle and his own determination, Ganesh is doing very well as a student and a human being today. Our team met Ganesh 4 years back through our “Parents’ Participation in Children’s Education” program in Undri area in Pune. Ganesh was already in school then but not his sisters and he always wished for them to be in school too. While conducting survey to find out of school children on the site, Ganesh was a big help to our team. When he understood our objective, he enthusiastically accompanied us to all the houses of kids staying in that area. He also expressed his wish to enrol his sisters to school and our team was more than happy to help. Ganesh is a smart and helpful kid. He is regular at school and is especially good in Mathematics. He also helps other students with their studies. The teaching staff is all praise for him as are we. Ganesh’s prowess at Maths prompted our team to look for ways to further his knowledge on that subject. We approached Mr. Barve of Bhaskaracharya Institute, Pune for vacation course on Mathematics. After the workshop, Mr. Barve got impressed by the boy's hard work and dedication and suggested to send Ganesh to attend Mr. Gore’s coaching class in Shanivar Peth, Pune. DSS team helped him to take admission in the coaching class. The distance between Ganesh’s place of residence and the class is 11-15 kms. The class timings are in late evening, from 5:30 pm to 8:30 pm and Ganesh has to take a bus to commute. He has never complained nor has missed a class. He manages his studies and helps his sisters and classmates too. He sees to it that all the children in his surrounding area attend school; in case they don’t listen, he informs DSS team for intervention. In 7th grade, Ganesh stood 1st in his school and secured 85% marks with 96/100 in Mathematics. Since his last school was only till 7th, he has now been enrolled to a new school so that he can continue his education. We, at Door Step School, strongly believe that every child can perform well with little help by right people at right time. Examples like Ganesh Sutar reiterate the importance and benefits of bringing all children into mainstream of education. We wish Ganesh all the best for his further studies and look forward to help many other children out there waiting for support! More power to you Ganesh!!! and thank you DSS.